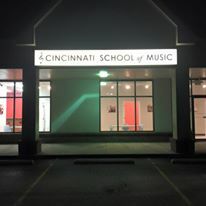 You can schedule private lessons with me (Mondays, Tuesdays & Saturdays) at the Cincinnati School of Music (Mason). 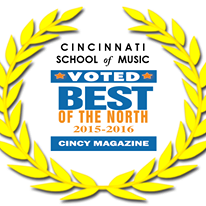 I also teach private lessons at my student’s homes in Cincinnati, OH. Rates are $25 per 30-minute lesson. Monthly rates are $100. This fee includes months with five lessons. Hour lessons are also available at a discounted rate. Lesson days are Monday-Thursday and Saturday. Contact me at 513.473.2269 for information and scheduling. Attendance: If you can’t make a lesson, you have two options: you can either do a make-up on a different day or I can add time to your next lesson(s) to make up the difference. If the missed lesson is the fifth one of a month, no make-up will be given. Make-up Lessons: Schedule permitting, I can provide a make-up lesson. Contact me directly to find a mutually acceptable time. Miscellaneous: If I’m driving to your home for the lesson, please allow a ten-minute grace period for traffic. You will still receive your full lesson time.